Christine D. Steere has been employed with Gold Crown Properties, Inc., since 1997 and currently holds the position of Director of Compliance. She is responsible for maintaining compliance oversight for the company’s Section 42, LIHTC properties. She has devoted most of her career to property management and has 22 years experience in property management including leasing, managing, marketing, legal matters and compliance. 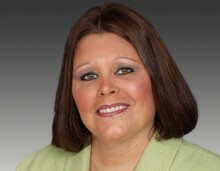 Christine began her career in multi-family property management in 1989 as a part time leasing agent. In 1995, Christine accepted a position of a LIHTC property manager and has since specialized in section 42, Low Income Housing Tax Credit including the successful rejuvenation distressed properties as well as the coordination and lease-up of new construction and acquisition/rehab allocations. Christine has completed the lease-up phase of numerous affordable housing and market rate communities to meet or exceed the established lease-up objectives and take the properties quickly into stabilization, placing and assuring the properties stay in compliance with State and Federal Section 42 mandated requirements. Christine’s professional affiliations include: SHCM designation, CAM designation, 2005 recipient of the Property Complaince Manager of the Year awarded by Apartment Association of Kansas City, Certificate of Completion of Housing Credits, Notary Public, numerous from KHRC of basic and advanced compliance workshops attended yearly since 1995. 2005 certificate of completion for Fair Housing, 1993 certificate in paralegal technology, 1994 degree of Associate in Applied Science from the Metropolitan Community Colleges at Maple Woods. Christine is a lifelong resident of Kansas City and currently resides in Olathe, Kansas with her husband Pat and son, Dalton.